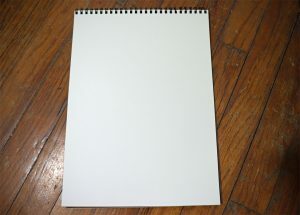 Normally when we draw we’re doing what’s called Additive Drawing; it’s adding charcoal, graphite, color pencils, or pen to a blank piece of paper. We draw, using an eraser as only an afterthought to remove mistakes or messiness. What if you turn that process on its head? Using your eraser as your main art tool, and using your pencils/charcoal to “clean up”. Sounds kind of backward, right? It’s called Subtractive Drawing, also known as reductive drawing or negative drawing. Recently I captured my process and wanted to show you. When I paint a live model in oil, one of my favorite ways of beginning is by doing what’s called a “wipe-out”. A wipe-out is where you cover your canvas in paint diluted by turpentine/mineral spirits and while it’s still wet you use a paper towel to wipe the surface, bringing out the lightness of the form. We can relatively do the same process with Subtractive Drawing. I start with Strathmore Drawing Paper because it has good tooth to it, making it able to hold on to the dry mediums; and it can handle all the necessary erasing in this process without mussing up the paper. 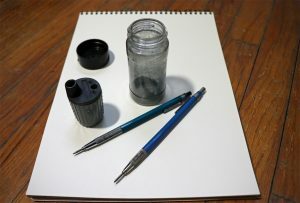 I tone my paper with charcoal/graphite dust rather than scribbling charcoal onto the paper. Why is that? Because drawing the charcoal onto the paper can work the medium too deeply into the fibers of the paper not allowing for erasing later on. You can either buy powdered charcoal or crush a charcoal stick in a plastic baggy. Carefully pour the dust into an empty spice shaker. Then add graphite dust to the powdered charcoal. 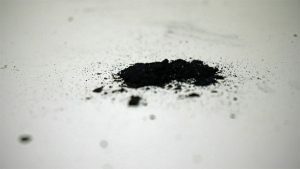 I get graphite dust from my mechanical pencil’s lead sharpener. If you do not use a mechanical pencil you can also purchase powdered graphite. *I’m putting links to all the products I’m mentioning in the highlighted words. Check them out. * In your shaker aim for a 50/50 mix of charcoal and graphite. 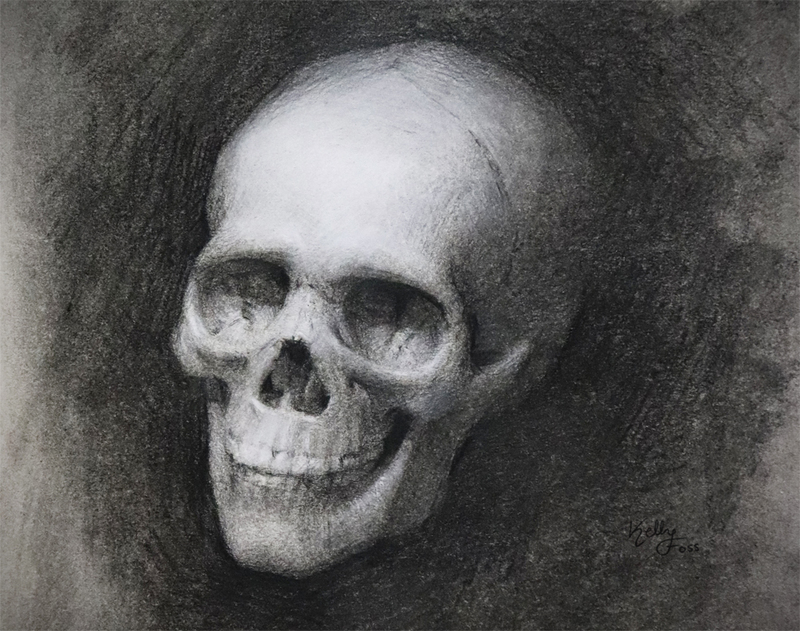 I find that the charcoal adds the darkness and the graphite helps it all cling to the paper, making the process less messy than using 100% charcoal. With your paper lying flat on a surface, pour a little pile of the dust and smear it around with a clean, dry paper towel. Play around with this “dark cloud”. You don’t need to make the darkness uniform or reach all the way to the paper’s edges. Any time your work with dry mediums, be careful to not get it into the air or breathe it in. Tap the excess dust into the trash or back into your shaker. Choose a light subject to draw. I went with a skull. I adjusted a lamp on the skull to give me distinct shadows. Now is where I truly begin drawing…with erasers. 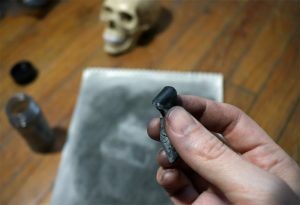 I started with a kneaded eraser, lightly pulling up the darkness on what I see as the brightest areas on my subject: my skull’s forehead. I continued lightly erasing other light facing areas of the form. It’s good for the shadows on your subject to stay lost to the background. Pay attention to the gradation of values rather than erasing each area to an equal degree. Your efforts towards subtly will pay off! Your eraser should be quite dirty like you can see mine was! Switch to a clean bit of eraser to help further lighten the lightest plane of your subject. Next up- using my favorite eraser pen: the Tombow Mono Zero. Use this or another hard white eraser to “draw” in the highlights. After the majority of your drawing by erasing, now go back in to add touches of darkness. I used Mars Lumagraph Black pencils because of their high levels of carbon; I like the deep richness they give while avoiding the metallic shine you can get from pure graphite pencils. This next step isn’t necessary but is oh so fun! Using my well-loved white charcoal pencil I further emphasized moments in the light. Now all that’s left is to tap off any loose medium and show your friends! 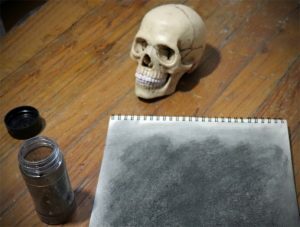 Consider using a fixative spray to help protect your drawing from smudging & dust. 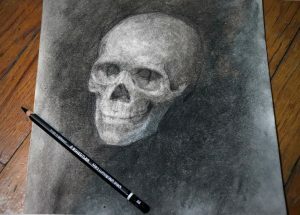 Have you tried Subtractive Drawing? Which do you like better: Subtractive or Additive Drawing? Would love to hear your thoughts! Please leave a comment below. And as always- Happy drawing! This is especially useful when our approach to drawing is to record the different values of the masses of the subject, as opposed to doing a “line drawing.” Almost like sculpting the subject as if it were a sculpture rather than a drawing. Touch ups (as you suggest) can be used with a carbon pencil of your choosing. I find this process much quicker at achieving a finished drawing. Same method is used when we are painting a subject with oils, pastels, etc. Wow! Truly a different way to draw, not that I’m a artist myself; as you know Kel, however this technique really surprised me. When I first started reading the article, I could not figure out how someone would use an eraser to “draw”. Wow shows how much the general public doesn’t know about the beauty of art and the different techniques. Thanks Kel for writing a great article that even a layman like me can understand. Dear Kel, your article is very enlightening, thank you very much.